The Saint-Gabriel Church is situated in the XXth ward of Paris, between the Place de la Nation and the Porte de Vincennes. This is a fairly recent edifice - if compared to most Parisian churches - as it was dedicated in 1935. It originates in Madame Dumay&apos;s memorial gift in honour of her late husband Gabriel Dumay. Before the present organ&apos;s building, there was a small Cavaillé-Coll organ installed on the left side of the church&apos;s entrance. It is said that this instrument had been owned by Marcel Dupré. In the early eighties the church&apos;s authorities entrusted the organbuilder Alcouffe with building a new tracker organ in the chancel of the sanctuary. Some stops of the existing organ were re-used in this new organ that was finished by the Steinmetz brothers, Alsatian organbuilders. This instrument was inaugurated in 1982. At that time there was no Pedal 16&apos; reed, nor a Cornet. Moreover the instrument displayed a number of disfunctions : the stop action was not reliable (hence some stops were difficult to tune), the wind was unstable, the Soubasse 16 was grossly underwinded, and so on… In fact the Parish was not wealthy and the organ had been built rather cheaply. Truly, when I visited it, I was quite amazed at the poor craftmanship of many elements. In spite of this, the instrument generated a fine sound effect thanks to its position in the chancel and to the acoustics of the sanctuary. In 1983, a Bombarde 16 was added to the Pedal thanks to a grant from the City of Paris (it should be noted that the church Saint-Gabriel does NOT belong to the City of Paris as it was built after the law of disestablishment was promulgated). A Cornet III-V was added to the Grand-Orgue, a little bit later, thanks to a private grant. For many years, the organ worked more or less reliably thanks to some minor repairs, but it was becoming more and more obvious, as time was elapsing, that a major renovation was necessary. An Association "Les Amis de l&apos;Orgue de Saint-Gabriel" was founded to promote a grand restauration, drawing parishioner&apos;s attention and raising some money. After many meetings and discussions, the German firm Klais was selected to carry out an important mechanical renovation of the instrument, electrifying the stop action and adding a combination action. Tonally, it was decided to keep the best of the existing stops and to add a Flûte Harmonique 8 to the Grand-Orgue and a Hautbois 8 to the Récit. The winding was to be regulated and the Soubasse 16 put on auxiliary motors in order to be correctly fed. 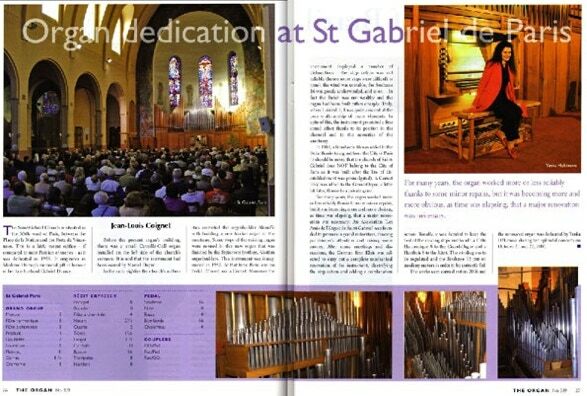 The works were carried out in 2006 and the renovated organ was dedicated by Yanka Hékimova during two splendid concerts on October 21st and 22nd, 2006. The picture shows the quite straightforward appearance of the organ; there is no real case but, a façade made of a wooden base sustaining pipes belonging to the Montre 8 (in tin), to the Pedale Flûte 8 (in copper) and to the Soubasse 16 (in wood). The console is incorporated "en fenêtre". Tonally, this organ is much more impressive than its moderate size implies and most listeners are quite astonished at the spaciousness of its Plenum and Tutti. The Cornet and Cromorne are amongst the finest stops of the instrument. Thanks to the new Flûte Harmonique, the "fonds d&apos;orgue" has gained grandeur and sounds convincing indeed in the Symphonic repertory. Very warm thanks are due to the various people who did not spare their time and efforts to support the project and carry out its realization : Father Roger Tanguy, canon of Saint-Gabriel, whose determination was so important, Yanka Hékimova, the members of the association and its President Rémi Dropsy, Philipp Klais and his collaborators who worked in difficult conditions, and to all music lovers and parishioners who helped this dream come true.